There is no shortage of stories and case studies about the IIoT. In aggregate, they support the assertion that the classic Buffalo Springfield song makes: “There’s something’s happening here; what it is ain’t exactly clear”. Unfortunately, the many IIoT case studies being written up throw the phrase “cloud” around like there is no tomorrow, and all the stories begin to blur together! Personally, I find it useful to have a model that helps me categorize IIoT use cases. I’d like to share the model that we use within our company, both when we are thinking about what IIoT use cases make sense for us as an OEM (with our Sentry Fire and Gas line), and also when we are working with our leading OEM customers to discuss and enable their use cases (with our FieldServer protocol gateway products). As the diagram shows, we categorize use cases into four steps, with each step having a different benefit or theme. And the reason they are laid out as steps is because we believe it is necessary to master each step before moving on to the next step. Step 1 is the lowest hanging fruit. 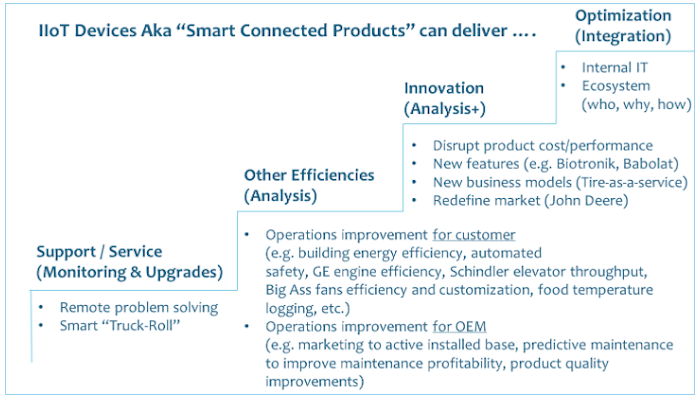 OEMs who make “smart connected products” can use the IIoT to improve support and service. By connecting securely and remotely with their connected devices (no matter where they are or how they were sold), the OEM and their sales/service agents can remotely monitor and troubleshoot their products. The OEM’s customers (the end customers) can avail of such a capability themselves as well, allowing the facility manager to always be connected to his assets. Note that we are not just suggesting that the OEMs feed their data to a SCADA or other management system and think their job is done. We are suggesting that every OEM, to the extent possible, look to establish their own secure connection to their products in the field. Armed with this remote knowledge, the OEM can either fix problems remotely or dispatch an appropriately equipped and informed service tech to the field, thereby leading to a much higher resolution rate. The key here is providing secure remote connectivity and access. This step is not about long-term data retention in the cloud, fancy analytics, and so on. In this step, the “cloud” is just a mechanism to provide this functionality. Also, as a general rule, in this step the maximum benefit accrues to the OEM, as it helps them raise their service game and helps them differentiate themselves from other OEMs. So we recommend that OEMs bundle such a secure remote access capability with their products. Shipping the smart connected product along with a FieldServer that can connect over a secure remote access “tunnel” to a cloud-based registration and access point is one way to do this. Step 2 focuses on using the IIoT to improve operational efficiencies – for the OEM, and even more interestingly, for the OEM’s customers. We have gathered many examples from the literature that fit in this “efficiency” category. For example, an OEM may use the data from their smart connected devices to understand their product quality and failure modes over time, or the OEM’s marketing department may use this data to identify which customers might be ready for a product upgrade offer. The OEM’s customers can greatly benefit from insights too. A facility manager of a building may use the data collected from the smart connected products to identify energy efficiency opportunities, or an airline may use the data gathered from the sensors in the engines across all its aircraft to determine if certain flight paths result in greater fuel efficiency. A commercial kitchen may use the automated logging and reporting of temperature data from all its refrigerators to satisfy food safety regulations, instead of the traditional approach of sending a worker out to each refrigerator every hour to record the temperature. Smart elevators may use information about how many people are waiting and past history of where people go at what time to provision elevator banks efficiently in high rises, and commercial fans may regulate their speeds based on occupancy, external humidity, individual preferences and so on. So many cool examples – but once you get the 4 step model in your head, you’ll realize they are all just variations of Step 2, both from a benefits perspective and from a technology architecture perspective. A word on the technology architecture required for Step 2. Identifying efficiency opportunities requires “analysis” and possibly (that other infamous word) “big data”. So while Step 1 as explained earlier is about secure remote access to the data stored in the remote smart connected products, Step 2 is about bringing that data to the cloud, organizing it, storing it, and sifting through it looking for efficiency improvements. That is the “cloud” plays a different role in Step 2 relative to Step 1. The cost of proving Step 2 benefits to themselves or to their customers are higher to the OEM relative to Step 1 as the OEM has to move and store data long-term in the cloud, and has to put in the intellectual work to define and develop the algorithms that drive the desired outcomes. We recommend that in Step 2, OEMs think carefully about selecting and pairing the right cloud storage and analytics platform to the cloud-based secure remote access capability established in Step 1. Shipping a smart connected product with a FieldServer along with the ability to plug into the right cloud analytics platform is one way for the OEM to offer Step 2 benefits. Best-in-class OEMs are actively looking at Steps 1 and 2 (often in that order), and we are privileged to have the opportunity to brainstorm these with our OEM customers. In the next blog post, we will look further ahead at Steps 3 and 4 and speculate on how smart connected products and the IIoT might usher in an unprecedented era of innovation, and not just efficiency. This first Sierra Monitor Networking Conversation video is an extremely comprehensive and important overview of the economic impact and changes that the Industrial Internet of Things (IIot) is making within our industry. 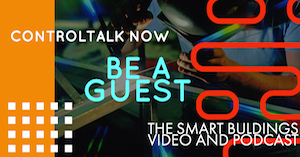 Join in on the conversation as Sierra Monitor’s CEO, Varun Nagaraj, rewards viewers with a remarkably down-to-earth insight into the most significant and economically vibrant aspects of IIoT and the opportunities these changes represent. The channels and business models for the OEMs, integrators, and facility/building managers are indeed changing. Are you? Register today for an educational webinar introducing our new EZ Gateway! 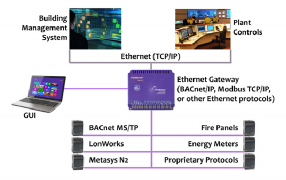 Integrating Modbus devices into BACnet networks is a common field application. Completing this integration in an efficient, reliable, and repeatable fashion is a requirement in today’s environment. 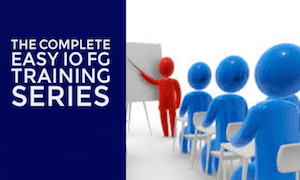 Our expert instructor, Richard Theron, will discuss how simple it is to connect Modbus devices to BACnet systems with the EZ Gateway and how to lower commissioning time and costs with features such as EZ Profiles and DeviceProxy™. REGISTER NOW! The EZ Gateway, the quick and easy Modbus to BACnet solution! 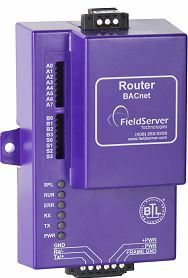 The EZ Gateway Modbus to BACnet is a quick and easy solution to a system integrator’s Modbus to BACnet integration needs, the integrator or contractor does not need to be a protocol expert to connect any Modbus device to a BACnet system using either BACnet protocol. DeviceProxy™, our unique device management feature allows each Modbus device to be presented as a corresponding virtual BACnet device, thereby providing granular visibility and control over each Modbus device within a BACnet management framework (examples: offline or online status is visible at the individual Modbus device). 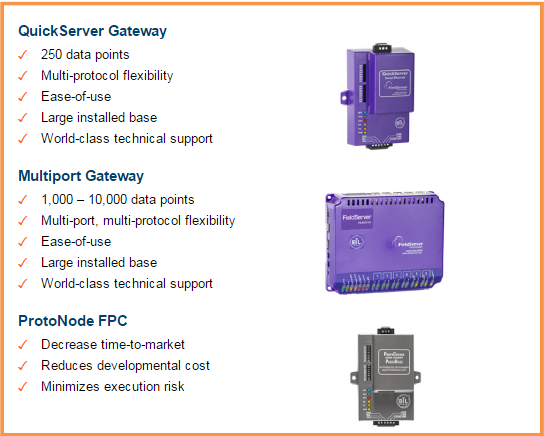 With EZ Profiles, integrators can create or upload predefined configuration Modbus to BACnet files into the EZ Gateway for fast configuration & commissioning. To learn more about our EZ Gateway Modbus to BACnet, visit our website and watch our EZ Gateway YouTube video. In this Sierra Monitor post (first of many), Varun Nagaraj, Sierra Monitor’s President and CEO shares his wealth of experience and industry knowledge positioned as a leader of a premiere global source of electronic communications, safety and environmental instrumentation, network products, and technical solutions. In November 2014, Professor Michael Porter and Jim Heppelmann attempted to answer the above question by introducing a framework around “Smart Connected Products” in the Harvard Business Review. They noted that each industrial device now has an unprecedented amount of sensing, processing and communications capability built into the product itself. As a result, these products can produce a lot of useful data which can be fed in near real time for analysis, which in turn opens up many strategic possibilities for players in the value chain. Consider an example highlighted by Accenture in their recent report on the IIoT. By adding sensors to their tires, Michelin now has the opportunity to sell “tires-as-a-service” by charging their customers for actual kilometers driven. Also, Michelin has created a fuel consumption reduction service for its customers. Data on fuel consumption, tire pressure, temperature, speed and location is brought from each vehicle to the cloud, where fuel efficiency experts analyze the data and make recommendations to the fleet manager on how to use less diesel for driving. Also, the data is available to Michelin product engineers so that they can continuously improve tire performance and reduce tire cost. How can I (the OEM, the user, or an intermediary) operate the products better? How can I (the OEM, the user, or an intermediary) service the products better? How can I (the OEM) make the product better? 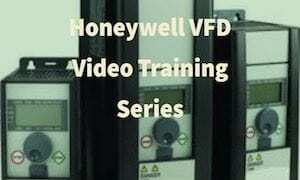 How do you put a value on the fact that the product can be operated better or serviced better? What is the value of insight into product usage that helps an OEM design a better product? Who incurs the cost and who gains the benefit? What is every extra byte of information worth (because the cost of transmitting and storing data in the cloud is not free)? How should the cost of the incremental technology be recovered? What % of the value captured by the end user should be shared with the OEM, by an intermediary, or by the OEM’s technology supplier that makes the smart connected model possible? What activities should be performed by the various players? Bluntly put: who does what, and who pays what? At Sierra Monitor, we are in a somewhat unique position as we grapple with these questions. We get to see this problem from two distinct vantage points along the value chain: One, we provide our FieldServer protocol gateways to OEMs to turn their devices into smart connected devices. Two, we offer our Sentry IT fire and gas detection system – which is a smart connected product – to our facility manager/safety manager customers. As a result, we are in constant conversations with different constituents in the value chain. During the course of the year, we will be exploring use cases and equitable business models with our OEM customers, our facility manager end customers, and our peers at industry forums like the MCAA. We will be developing and demonstrating cloud based applications to our customers because a conversation around a business model is easier to have while looking at and manipulating real screens. We will be in workshop / exploration mode rather than sell mode because there is still much to learn collaboratively. I hope to use this blog to share those learnings and to speed up our industry’s collective adoption of the IIoT vision. Recently, San Francisco’s Levi’s Stadium hosted a record-breaking 76,976 people for the World Wrestling Entertainment’s Wrestlemania 31 event. 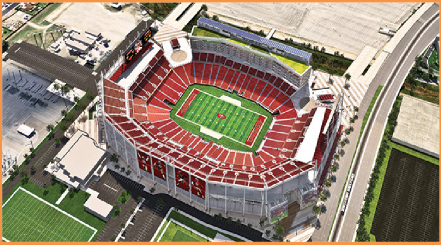 Sierra Monitor Corporation took great pride knowing that many of Levi’s Stadium’s enormous, yet intricate water systems were integrated to the BAS using their FieldServer protocol gateways (FieldServer Case Study — Levi’s Stadium, Santa Clara, CA). Levi’s Stadium, the new home to the San Francisco 49ers, is a $1.2 billion venue with 1.85 million square feet, seating approximately 68,500 and featuring 165 luxury suites and 8,500 club seats. Levi’s Stadium is the first U.S. professional football stadium to achieve LEED (Leadership in Energy and Environmental Design) Gold certification, a standard rating for the design and construction of ‘green’ buildings. LEED certifications are based on points awarded for materials and resources use, water efficiency, energy and atmosphere, and other factors. Important to Levi’s Stadium’s LEED Gold certification was the ability to interconnect and centrally monitor and control the systems that keep the stadium comfortable and operating efficiently. Because Sierra Monitor can support nearly any available protocol, many providers chose Sierra Monitor products to interconnect their disparate systems. The stadium’s building automation system (BAS), which acts as the central controller for facility systems such as water reticulation and HVAC, was provided by Automated Logic Corp. (ALC) and installed by Sunbelt Controls. 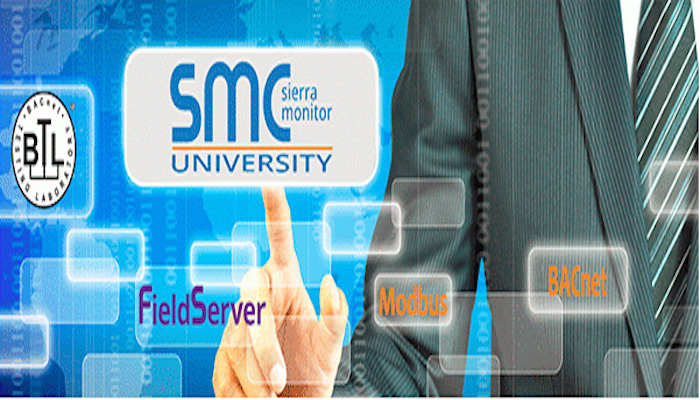 Providing interfaces—and protocol conversions—between the BAS front end and 26 different systems and devices needing control are Sierra Monitor FieldServer gateways, BACnet MS/TP protocol converters and ProtoCessor ProtoNode protocol gateways. Not surprisingly, water is a huge issue for Levi’s Stadium, whether it’s for drinking and kitchen use, field irrigation or wastewater from the restrooms. Unitronics PLCs control the valves and VFD drives that manage the stadium’s water reticulation; the Unitronics PLCs use Sierra Monitor FieldServer QuickServer protocol gateways to connect to Automated Logic’s BAS via BACnet MS/TP for monitoring and control. Similarly, the AERCO hot-water boilers interface to the ALC system via the BACnet MS/TP interface provided by ProtoNode protocol gateways. Stadium facilities managers can now prime water systems in anticipation of a big game day, monitor water pressure throughout the complex, and control the wastewater system to maintain optimal operation even with 70,000 visitors in attendance. In addition to open stadium seating, Levi’s Stadium offers premium seating in its 165 luxury suites that include climate-controlled enclosed spaces and upscale catering provided by 22 kitchens. In each of these luxury suite kitchens, a Halton kitchen exhaust fan uses a BACnet MS/TP interface via ProtoNode to transmit valuable energy management and control information to the ALC system. Kitchen ventilation can be controlled based on numerous inputs, including whether luxury suites are empty or in use, or the external temperature at the stadium. Being awarded LEED Gold certification is a big achievement for Levi’s Stadium, and they could not have reached that goal without the intercommunication and centralized monitoring and control made possible by Sierra Monitor products.